For a few years prior to the 2017-18 season, if you went to a Denver Nuggets game at the Pepsi Center one of the first things that you realized was how empty the arena was. Even after being just a few years removed as one of the most entertaining teams in the NBA with George Karl’s fast paced teams and the addition of budding stars Nikola Jokic, Jamal Murray and Gary Harris, fans still were unwilling to come to games on a regular basis. Last year however, things started to change and this is the year that things could turn around completely. Denver finished with 577,898 fans that came to watch the team play in the 2015-16 season which placed them as dead last in attendance of the 30 NBA teams. That season, the Nuggets also didn’t play up to their standards as they finished with a 33-49 record, good for 10th in the Western Conference and wanted to shake things up heading into the offseason. Right before the 2015-16 season, Denver traded away long time point guard Ty Lawson and drafted who they expected to be the point guard of the future in Emmanuel Mudiay. The Nuggets had a core of Mudiay, Harris, Danilo Gallinari, Wilson Chandler and Kenneth Faried with Will Barton, D.J. Augustin and Jameer Nelson also contributing off of the bench. 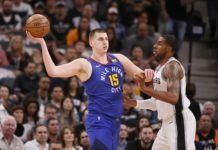 This was also the season that there were glimpses of brilliance from Jokic as he emerged as a Rookie of the Year candidate as they shifted away from Bosnian sensation Jusuf Nurkic. While the team wasn’t as successful as they hoped for, they were fun and made basketball enjoyable again with one of their biggest concerns being internal. They were recovering from the Brian Shaw-era of desolated basketball with a toxic culture while also attempting to get back to playoff basketball. The Nuggets, however, did not make the playoffs in the 2015-16 season and that plays a big part as to why fans were not coming out to watch them play. Still, things were beginning to change in the Mile High City and the most important part of that change was that it brought a new regime starting with a new head coach. 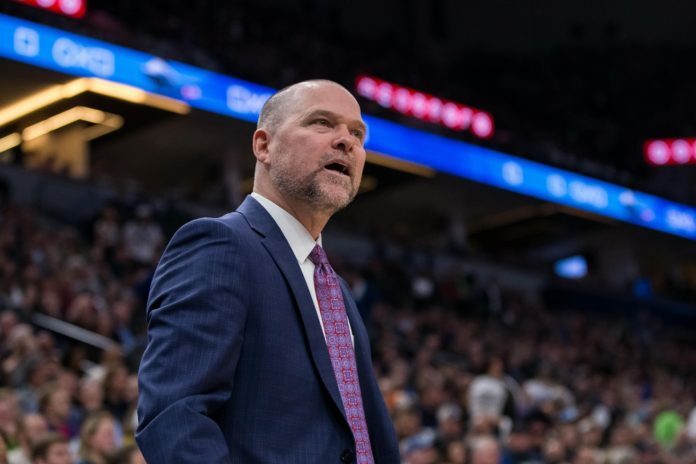 From the second that Michael Malone arrived, he immediately began to change the locker room and culture left behind in the disastrous Shaw tenure. The culture had been set and this was the start of something new as players seemed to have bought in and showed more effort that wasn’t present before and fans were beginning to see it. 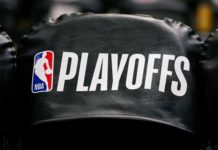 Before the 2016-17 season began, there was hype among some in NBA circles that this would be the year that the Nuggets would finally get back to the playoffs. That hope wasn’t enough as it was much more of the same as the team had a better season in terms of their overall record and effort given, but it would still take some time for the casual fan to jump back on the band wagon. Denver hit the reset button in many regards, but there still was a void that needed to be filled — actually making the playoffs. With a roster that the fans enjoyed watching, a future superstar in Serbian big man Jokic, excitement after drafting sharpshooter Jamal Murray with the seventh overall pick, and a cultural shift in the locker room with a new coaching staff that often expressed the need to win, fans started to slowly embrace coming out and supporting the team. Despite finishing in dead last for the second consecutive year as far as attendance, there was still an increase in fans that came out to support the team. The was a jump from 577,898 fans to 605,585 and it had everything to do with their success. No, the team didn’t qualify for the playoffs for the fourth straight season, but it was the closest they’ve come to making it to the postseason since the 2012-13 season. While missing the playoffs was disappointing for some fans, there were many reasons to take a look at this season as the one that might have been turning point. The team improved their win total by seven wins as they went 40-42, which was good for 9th in the Western conference. They also were in the second year of the Malone era with a young team that started to feel as if they could finally win and were having fun doing so. They were playing inspiring and energetic basketball again — something that the Shaw era never displayed. The team started getting a bit of national attention as their young core finally began to take shape. Jokic became one of the premiere players in the league with his absurd post all-star break stats including six triple-doubles that all came after March. Murray’s burst onto scene as a rookie forcing Denver to shift from Mudiay to the Kentucky product. Harris’ maturation and career season showed that he could be much more than a glorified role player. By the time that the 2016-17 season came to a close, the Nuggets were the most improved offensive team in the league as they scored 7.3 more points per 100 possessions (110.3) than they did in 2015-16 (102.7). Fans were finally starting to come around and paying attention. The 2017-18 season came to an end in devastating fashion as the team went through a very rare win-and-make-the-playoffs game on the last day of the regular season against the Minnesota Timberwolves in one of the closest playoff races to date. The Nuggets missed the playoffs for the fifth season in a row, but the truth was that Denver was as fun to watch — if not more fun — as they were during the Carmelo Anthony era and it generated a buzz around the city. Denver fans were filling arenas as the team relentlessly battled to make the playoffs and as a result, attendance spiked dramatically. During the 2012-13 season, a year in which a Karl-led Nuggets team lost to the Golden State Warriors in the first round of the Western Conference playoffs in six games, fans came out to support the third-seeded Nuggets in droves. Denver’s attendance was as high as 14th of 30 teams as 730,616 fans came out to support the team throughout the year. Denver fans have shown that when the Nuggets are winning and if they find a way back into the postseason, Denver fans will come out and support. That’s a hell of a spike in attendance. This past year was the first time that Denver cracked the 700,000 fan threshold — which is the most attendees since the 2012-13 season, and the Nuggets finished the 2017-18 season in 19th of 30 teams as far as attendance goes. A massive jump happened in only a year as 702,796 fans came to the Pepsi Center to watch the team in action. There was as much optimism as there’s been heading into the season because of how active the Nuggets were during the offseason. The team resigned Mason Plumlee, gave Harris a massive extension, traded down in the draft and acquired Trey Lyles and Tyler Lydon, parted ways with long-tenured veteran Danilo Gallinari and brought over all-star talent Paul Millsap for three years, $90 million. Those moves coupled with Harris and Barton becoming consistent forces in the backcourt, Murray showing promise as a building block for the organization, Malone finding his core group when creating an elite offensive attack, and Jokic now as the face of the franchise, it was now time for it all to come together and the team to make the leap forward to get back into playoff contention after missing the playoffs for four consecutive seasons. Denver ultimately failed to live up to expectations, but showed continued signs of promise and progression in a season of consistent turbulence as the team obtained a much-improved record of 46-36. Furthermore, the team finished the season ranked sixth in the league in points per game and had their best season in five years. 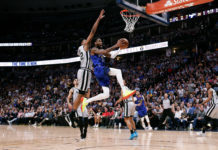 For the moment, it appears as if the Nuggets are back to their entertaining ways and it is an exciting time for the fans to get back into the Pepsi Center to see for themselves. If this last year is any indication for the year to come, Denver should have even more fans and get back to the days of being one of the most entertaining teams in the NBA and with excitement comes support from the fanbase.